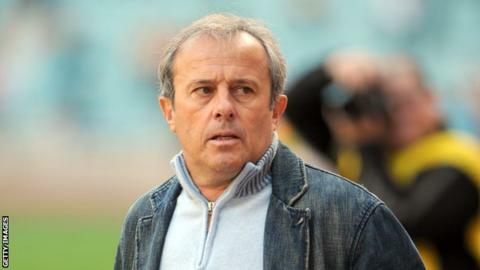 The Congo Football Federation says it has agreed a deal with Pierre Lechantre to become the country's next coach. The Frenchman is due to sign a contract next week, when further details will also be made public. Lechantre is set to replace his compatriot Claude LeRoy, who stepped down in November. The 65-year-old has coached Cameroon and Mali in the past and his most recent job was with Libyan club Al Ittihad Tripoli. Congo are currently top of their group for 2017 Africa Cup of Nations qualifying, ahead of Zambia on goal difference after two matches. Lechantre's first competitive games in charge will be back-to-back Nations Cup qualifiers against Zambia in March. Kenya and Guinea Bissau are the other two teams in Group E.
The Red Devils are also in June's draw for the final round of qualifying for the 2018 World Cup.